Have you ever found yourself stuck indoors on a rainy day and you're bored out of your mind? Or maybe you just never even got out of your bed that morning because the rain made you tired and all of the sudden its five o'clock in the afternoon and you've achieved absolutely nothing? Do not worry because I am here today to give you some ideas for what to do on a rainy day! Put your skills in food preparation to the test- Put on an apron and make something homemade. This is a good rainy day activity because you can eat whatever you've made when your done! Personally, I could scroll through my Pinterest for hours and more often than not, I find myself scrolling through delicious looking recipes. A rainy day could be just what I need to finally try out one of those recipes. 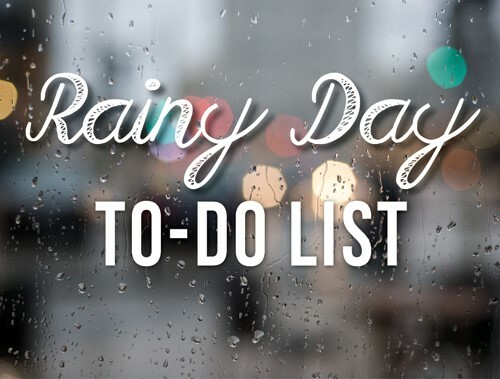 Organize- Rainy days are the perfect time to catch up on cleaning. If you really put your mind to it, your living space could be nice and clean within half a day or so. Listening to music always really helps me when I am cleaning since it makes the ordeal a little less painful. Crafting- Crafting definitely requires some time and effort if you want good results so this activity is a pretty solid option for when you're cooped up inside for a day. Lazy Day- This could be the perfect opportunity for you to catch up on your favorite TV shows or watch a good movie with a nice cup of warm tea. Maybe you've been stressed out a lot and this could come as a much needed de-stressor! Invite some friends over for a Girls Night In- Take out your favorite board games, create a homemade indoor spa, or just sit down to have a life chat with your friends. You won't regret opting for some girl time on this otherwise boring day- I promise! Book a trip- Do you need to book a trip to somewhere and it either keeps slipping your mind or there's simply just other stuff to be done? The rainy weather that has you holed up inside could provide you with the perfect opportunity to get this done!